The website design for this entire site was done by Media Elements LLC from concept to launch we helped to make all the artwork necessary for launch of the site. When we first started this project the client was selling their services on an outdated design. Very few people even knew what their services were. The site now serves three times the number of users. The colors, design, navigation, functionality, and a ton of other details were updated on this site to make it a lot easier to use and to understand. Verizon is the channel partner of a client called Exent Technologies. They are a global leader in developing and marketing software products and services that enable the broadband-based delivery of video games known as Games-on-Demand. Games-on-Demand services are designed to monetize the extensive catalog of video games that are no longer likely to generate significant revenue through retail sales channels. This is achieved by a broadband-based distribution of video games to end-users through paid subscriptions and through free, ad-supported offerings. They market and sell their unique video game digital distribution platform and video game advertising technologies directly and through channel partners to broadband service providers and media companies that offer Games-on-Demand services to their end-users. Get the games you want, when you want ‘em! 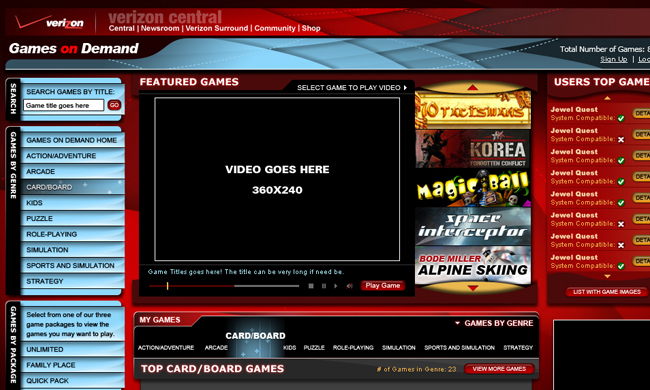 The worlds largest on-demand PC game library brings you puzzle, arcade, hidden object games and more. From Tomb Raider to Bejeweled- get classics to the hottest new releases all for less than 2 cents a title. Download the games directly to your computer from Verizon’s secured network means no trips to the store, annoying packaging, and crazy prices. Best of all, you can play anytime for as long and as much as you want.